We were preparing to head to our local library tonight for the summer reading kick- off program. We had a bag full of books, movies and books on Cd to return and many more to pick up. We were the first ones at the library for the kick- off event tonight. The boys were very excited. 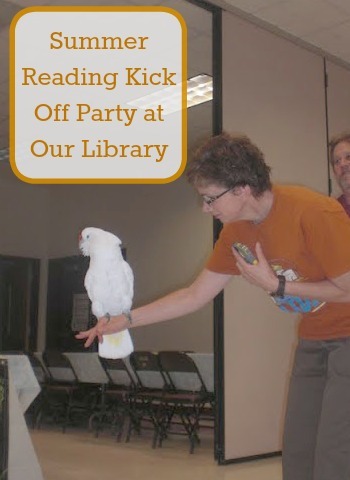 Our library arranged for a program called Creature Teachers to come with a bunch of their animals to talk about them, their natural habitats and diet. My kids love animals so this was right up their alley. Alec was convinced he wouldn't be stumped-- but he was! I was too! There were many new animals that we had never seen in real life before. We had front row seats and it was a good thing too! I think they had over 80 people show up. While that may not seem like a huge number that's a really big turnout for our library. We saw a cockatiel, an alligator, a skunk, a kookaburra, a Coati, a cane toad (wow! they're huge! ), a tarantula, a red- eyed tree frog, and a boa constrictor. Because we were early we got to pet the cockatiel and watch it walk around the room. The cockatiel has learned to open it's own cage and can do so in under 3 seconds. We learned that Alligators and sharks will fall asleep if flipped over onto their backs and watched as this was demonstrated with a live 8 year old alligator. We learned how to make a Kookaburra call his sound back at us. glands to kill a full sized crocodile if eaten. The skunk was actually pretty cute (and de-scented).